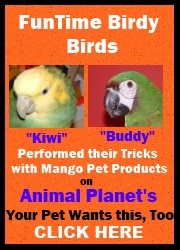 What a great package of fun for you and your feathered friends. Enough wood and plastic bird toy parts to make an interesting array of fun bird toys for your birdies. Also, can be a great sample package of fun bird goodies to see what your feathered friends like the most. The FunLand FunPack includes 5 Medium wood slices with a 5/16" drilled hole, 5 Wood Chunkies with a 1/2" drilled hole, 6 FunLand Characters with 5/16" drilled hole, 4 FunLand Characters with 1/2" drilled hole and 6 Feet of Superior Poly Rope. FunLand FunPack Bird Toy parts are ideal for African Greys, Amazon Parrots, Cockatoos, Macaws and all similar size birds.